Say what you like about the Turner prize — and we all have — but in its 27 editions so far, it has managed to contribute something very valuable to our national artistic life: a sense of roundup. Most years, the Turner has managed, however dimly, to reflect the active currents of British art. Amazingly, the current director of Tate Britain disagrees. In her introduction to this year’s effort, the increasingly irritating Penelope Curtis kicks off her rambles by insisting the prize is “not a barometer of what is ­happening in contemporary art”. In her opinion “the shortlist is circumstantial”. All it reflects is “four individual choices”. This lifeless view not only betrays all our greater hopes for the Turner, it misunderstands the shoal-like nature of art-world thinking. In the art world, opinions, tastes, prejudices are passed from private view to private view, biennale to biennale, jury to jury. The Turner is true to its times because the decision-makers who shape it are the inhabitants of a trout pond, congregating where the food is dropped. The clear evidence for this is this year’s shortlist. All four artists on it glow jointly with the moods and colours of today. Thus, Spartacus Chetwynd, who claims to live in a nudist colony in south London — funny, I never see her around! — is a performance artist. She was born Alalia Chetwynd, but later became Lali Chetwynd, then the ridiculous Spartacus. So even her name is a performance. As the first performance artist to feature as a Turner finalist, Chetwynd is obviously reflecting the art world’s current appetite for her kind of spectacle. Tate Modern has recently opened its Tanks gallery specifically to cater for performance art. The Whitechapel Gallery has special fortnights devoted to it. And, until October 28, Tino Sehgal has arranged for various happenings to happen to visitors in Tate Modern’s Turbine Hall. Right now, performance art is ubiquitous. 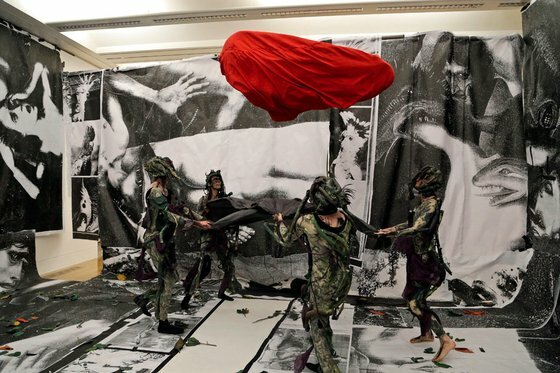 You’d have to be the director of Tate Britain not to ­recognise the barometric per­ti­nence of having Spartacus ­Chetwynd on the 2012 shortlist. Her contribution begins by settling visitors down on a mattress in a gallery yurt created from flapping blow-ups of Victorian natural-history ­illustrations. Pictures of parrots. Bits of dinosaur. This rough-and-ready scientific imagery ­creates a downmarket magic forest into which wanders a gang of blokes in leotards dangling with tent­acles, who gyrate energetically before you, pretending to be mandrake roots. One of the blokes holds up “the oracle”, a conspicuously handmade mandrake puppet, and whispers gnomic instructions in your ear. Mine was: “Your Oyster card has an uncompleted journey.” At which point I was led out of the yurt and into a space decorated with more blow-ups of old books and placards, most of which seemed to be insisting money was bad for you. It was like wandering into one of those performance fields at the Glastonbury festival. Good fun, good for the spirit, but not much more. Drawing on assorted handmade theatrical traditions, from mystery plays to Punch and Judy shows, it was junk-shop theatre that privileged the textures of the carnival and the puppet show. What was missing — what is usually missing in performance art — was a deeper sense of purpose. This was the folksy language of the people used only to broadcast the gnomic pronouncements of the artist. All the textures of the mystery play have been borrowed, but none of its communal relevance. That said, Spartacus is a lively presence on the shortlist, and, because she reflects both the current taste for performance art and the recent British fascination with folk traditions and village pastimes — think of ­Jeremy Deller, Grayson Perry — she certainly deserves her place. The best and most significant artist on the shortlist is Paul Noble, who makes minutely detailed drawings of an imaginary location called Nobson Newtown. Noble has now been imagining Nobson, in brilliant detail, for 15 years. His quest to map and picture the whole town, building by building, situation by situation, has become one of those heroic quests in art that invariably signals an important talent: think of Cézanne’s tussle to paint Mont Sainte-Victoire, or Mondrian’s constant rearrangement of red, yellow and blue. The usual understanding of Nobson is that it is an artistic version of somewhere like ­Milton Keynes: a purpose-built utopia in which Big Brother set out to create the perfect town. In Nobson, however, the social engineering has gone seriously wrong and reached profound levels of absurdity. For this particular selection of town views, Noble has cheekily singled out the role played in Nobson’s descent into ridiculousness by museum displays and public sculptures. Not only are its squares filled with turd-like mounds of modern art, lifted up on pedestals, but several of the drawings have familiar museum displays at their centre: shelf­loads of mix-and-match artefacts, presented portentously in typical art-world vitrines. Thus, Noble is taking a pop at the Tate itself, and at the role played in modern society by art. In Nobson, art’s task is to keep the plebs amused with infantile galleries full of toys and to cheer up the town’s ghastly concrete plazas by plonking huge sculptural turds in them. Hilariously, the big Tate favourite Henry Moore is given a frightful ribbing, not only in the drawings that quote his outlines, but in a set of sculptures dotted about the room that feature yet more curly turds, carved delicately from marble. James Wines’s famous quip about Moore’s ubiquitous sculptures littering the squares of the world like “turds in the plaza” has been uproariously visualised. Determined, funny, cogent, brilliantly drawn, profoundly original, profoundly relevant, throbbing with accusation as well as humour, Noble’s art is by some way the best work on show here. It ought easily to win the 2012 Turner, but the juries of the trout world have an appetite for awkwardness, and this one is certainly capable of tossing the gong to someone else. If they toss it to Elizabeth Price, it will be a mistake, but not a tragedy. Price has made a cutty, clever and occasionally dazzling 20-minute film about the idea of a choir, or chorus. The film begins in a gothic church, with an inventive exposition of the origins of the word “choir”. This section segues into a poppy one involving a chorus of 1960s girl groups, notably the Shangri-Las, singing Out in the Streets. Finally, we do indeed get out in the streets, with a chapter focusing on a terrible fire in 1979 that killed 10 people in a Woolworths in Manchester. The “chorus” is the much-replayed evidence spoken by a circle of eye­witnesses who saw the tragedy unfold. Alas, this last section, which tries to be the most meaningful, is also the most predict­able. It’s a shame, because until then it was going brilliantly. By including Price’s flawed but mostly impressive film, the Turner is reflecting the conti­nuing appetite in modern art for the textures of cinema. A gene­ration that grew up with movies is now determined to make its own. It’s a particularly unfortunate ambition to nurse for the fourth artist on the shortlist, Luke Fowler. His 93-minute rumination on the twisty thinking of the Scottish psychiatrist RD Laing is tedious beyond words and, frankly, an insult to the word “art”. I did not become an art critic to watch 93-minute films in the dark. That is Cosmo Landesman’s job. In a cinema. Fowler’s endlessly circular waffle about the endlessly circular Laing would last two minutes before a mass walkout. Only in an art gallery could anyone get away with such drudgery. The horror of it is, Turner prize juries are so inbred these days, he could actually win.